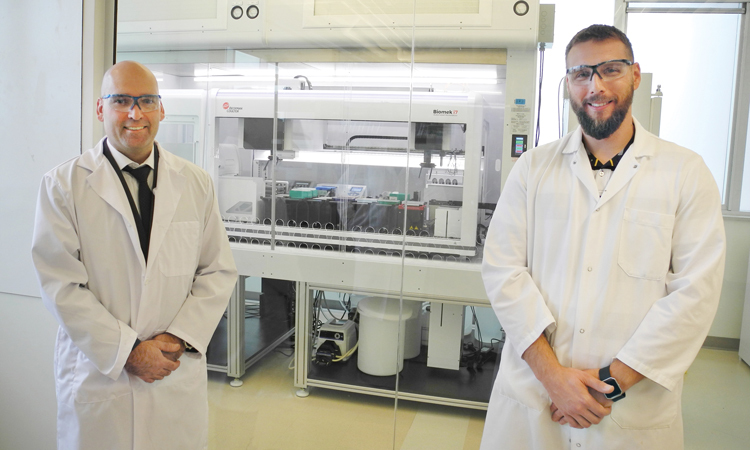 Brad Haltli and Martin Lanteigne work at the Nautillus-Croda lab, located at the Regis and Joan Duffy Research Centre at the UPEI campus. Behind them is the new robot, which can perform multiple laboratory tasks. In the fall of 2018, Nautilus Biosciences management and staff, members of the PEI Bioscience cluster, and international guests celebrated the official opening of the Nautilus Biosciences Croda Centre of Innovation for Marine Biotechnology. “This is a milestone event as we welcome Croda International as our latest international investor in the outstanding technology platform and brainpower centre that PEI’s bioscience cluster has become,” says Rory Francis, Executive Director, PEI BioAlliance. “Croda and Nautilus have worked together closely over the past six years to develop actives with applications in skin care and hair care, and more recently, in crop care,” says Sandra Breene, President, Personal Care, Croda International, PLC. It is hoped that the first commercial product will be launched in the next couple of years as part of the range of personal care actives sold under the Sederma brand. “Part of the reason I moved to PEI was because of how academia, industry, and government work side by side in this fantastic building,” says Dr. Russell Kerr, Research Fellow, Nautilus Biosciences Croda. Dr. Kerr introduced some recently acquired technology. “Our new state-of-the-art liquid handling robot allows Nautilus staff to get results much more quickly with much greater precision. Microbes are fermented, extracted, and screened for natural products that can be used as actives for use in a range of industries, including personal care, crop care, and areas we have not imagined yet. Nautilus, founded in 2007 by Dr. Kerr, focuses on the discovery and development of marine microbial diversity to develop new natural products. Scientists at Nautilus collect microbial samples, culture and purify them, determine their identity, ferment them, and extract and test for active ingredients that can benefit animal and human health. Staff have a variety of education backgrounds, such as Bachelors, Masters and PhDs in chemistry or microbiology, as well as Engineering and Bioscience Technology diplomas. Job titles include Research Scientists, Research and Technical Managers, and Team Leaders. Stephanie Duffy has worked for Nautilus since 2011. She earned a double major in Biology and Chemistry at UPEI, and then took the bioscience technology course at Holland College to get hands-on experience. She works as a Research Scientist in the Nautilus fungal microbiology lab located at the Atlantic Veterinary College. Brad Haltli, Research and Technology Manager at Nautilus, earned his undergraduate degree at what is now Thompson Rivers University in Kamloops, British Columbia. He did his graduate research at Dalhousie University in Halifax. Martin Lanteigne has been with Nautilus for 10 years. He earned a BioTechnology diploma at New Brunswick Community College in Grand Falls, New Brunswick. Recently, he took in-depth training in the US to learn to operate and program the robot. Martin, who was doing the testing manually before the robot was installed, had developed repetitive stress injury. Now that he has learned to program the robot, testing that could take a person a half day can now be done in 40 minutes. For more information, contact Dr. Russell Kerr, Research Fellow, Nautilus Biosciences Croda, at 902-566-0565 or email [email protected]. Visit www.nautilusbiosci.net. For more about PEI BioAlliance, visit www.peibioalliance.com.